When I heard that former Congressman and former Gubernatorial candidate Tom Perriello was going to do a panel discussion to discuss How the Local Environment Effects Brewing at the BadWolf Brewing company, the place where I held my first Plug-In Day event back in 2013, during Drive Electric Week 2017, I knew we had to do something. 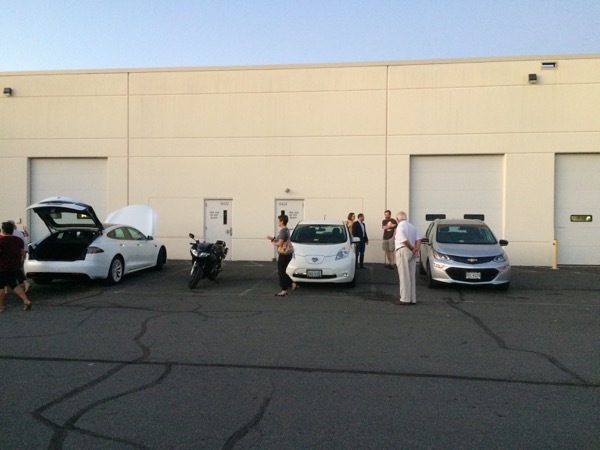 We showed Mr. Perriello a Tesla Model S, with Summon, a 2016 Nissan LEAF SL, #CO2Fre, and a Chevy Bolt, then we all attended the panel discussion inside. It was a great, low-key event to cap off my 11th event as captain. Please also checkout the How Local Environmental Effects Brewing facebook event page for the latest information about the discussion. Registered attendees report 27,000 electric miles driven.